The past week has been intense. We have seen shocking images from Boulder and surrounding areas that are literally under water. Every body of water near us is overflowing and rushing at a scary pace. Fortunately, our area hasn't seen much damage from all the rain. We had some serious street flooding the first day the storm system came to our area, but since then it has just been wet. It's a helpless feeling watching rain continue to fall knowing that there has been way too much already and that every drop that falls just adds to the destruction. It's an especially confusing feeling when all you've done is pray for rain to fall in the midst of a drought. I don't have the answers to why natural disasters happen or how to cope with the aftermath, but I do know that I almost always turn to baking. In Japan we didn't have a proper oven, so after the earthquake and tsunami, I made pancakes. We didn't know what was happening with the power plant in Fukushima and it seemed like every 5 minutes brought another aftershock. But I knew how to make pancakes. It was something certain. Something steady and reliable. It helped immensely to keep me calm and focused. Mostly. Yesterday, while the rain fell steadily outside for the 6th day in a row, I made snickerdoodles. This might be my favorite cookie, which is strange to say because I don't make them very often. Every time I do, I remember how I love the way they melt in my mouth. How every bite is a perfect combination of crispy and chewy. And, oh, the cinnamon-sugar coating... Yum. This recipe is from my absolute favorite baking book: Baking Illustrated. If you don't have this book in your collection, you need it. Now. Just do yourself a favor: head to the Cook's Illustrated site (click here) and order it. They even have a section outlining how to cook in high altitudes which is based on their testing experience in Golden, Colorado. 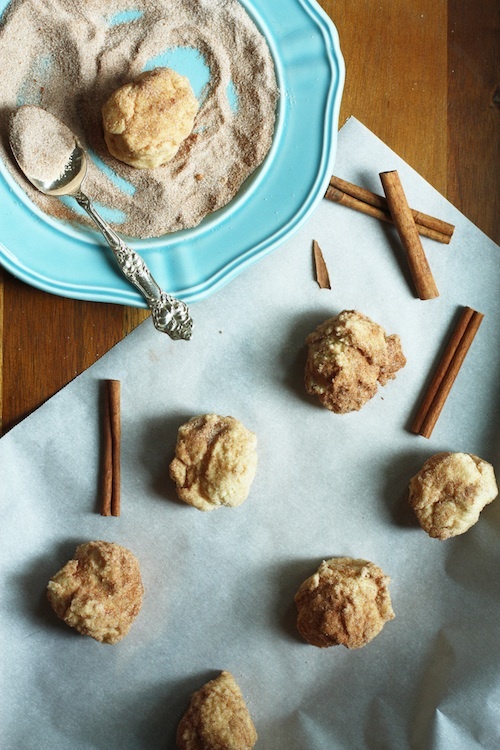 While you bake these cookies, your kitchen will fill with the lovely smell of cinnamon, sugar and butter. It's wonderfully comforting. So if you're at a loss for what to do this week, just bake some cookies. It'll help. Move your oven racks to the upper and lower middle positions. Preheat the oven to 400 degrees. Whisk the flour, cream of tartar, baking soda, and salt in a medium bowl. Set aside. Cream the butter, shortening and 1 1/2 cups of sugar together in the bowl of an electric mixer set to medium speed. This should take about 1 minute. Add the eggs and beat until combined, about 30 seconds. Add the dry ingredients to the bowl and beat on low until just combined, about 20 seconds. Combine the 3 tablespoons sugar and 1 tablespoon cinnamon in a shallow bowl. Take a heaping tablespoon of dough and roll it into a ball. Toss in the cinnamon-sugar mixture and place on your prepared baking sheet. Repeat with the remaining dough, placing the balls about 2 inches apart. Bake for 9-11 minutes or until the edges are just starting to turn golden and the center is soft and puffy. Halfway through baking, switch the baking sheets from top to bottom. Let the cookies cool for a couple of minutes on the baking sheet before transferring them to a wire cooling rack. 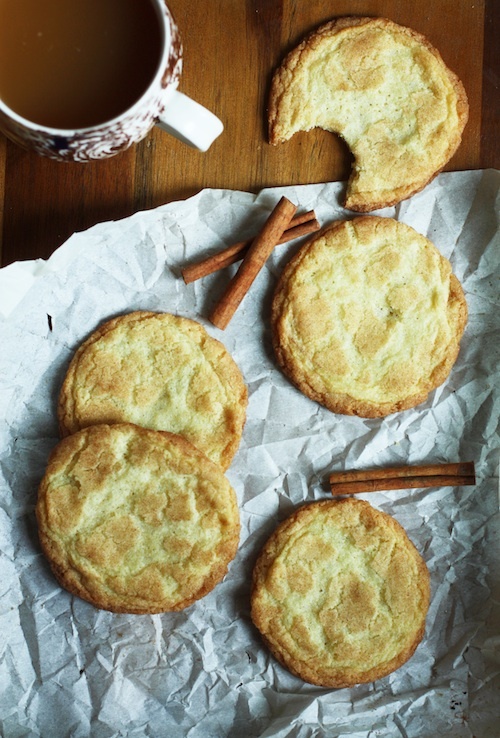 Best enjoyed with a big glass of milk or hot apple cider.